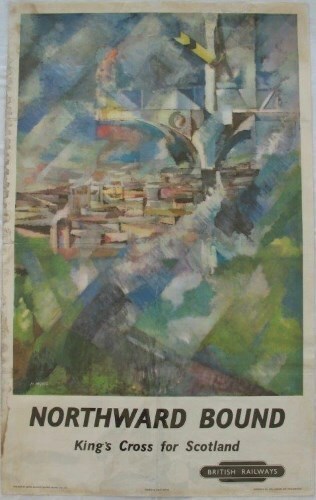 Lot 134 D/R Poster 1953 BR "Northward Bound - King's Cross for Scotland" by Bernard Myers. An abstract composition of English green fields, Scottish blue and white, with a clear signal and Hadrian's Wall. Edge staining and old folds and tears, backed on conservation paper.